I found the idea behind the below Sankey diagrams quite compelling. Both are from the user manual of the ‘Umberto for Carbon Footprint’ software by ifu Hamburg. They are also the makers of e!Sankey, and it seems as if most of the e!Sankey software features are also included in this new software for modeling and calculating product carbon footprints. I played with the demo models included in the trial version, one of which is for a toy parrot. 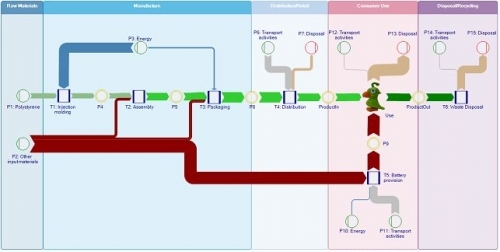 The product life cycle is modeled from cradle-to-grave with the raw materials, assembly, distribution, use, and end-of-life phases. Using embodied carbon data from an LCI database for the raw materials and energy used along the life-cycle, a carbon footprint is calculated. 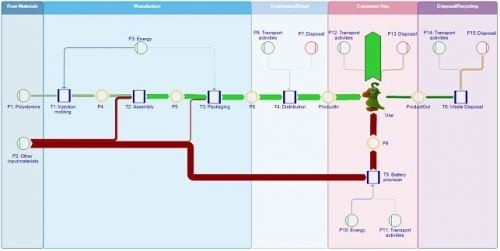 The material and energy flows related to the product manufacturing and use are then shown as a Sankey diagram. The Sankey view can be switched to an ’embodied carbon’ or carbon load view, which shows the ‘carbon rucksack’ of the product as it cumulates along the supply chain. In this second Sankey diagram the arrows representing the greenhouse gas burdens caused by the waste disposal phase are turned around, so that both the upstream supply chain as well as the downstream processing after the product use are visually added. They form one large Sankey arrow (shown in green here) for the product’s carbon footprint. This is of course not a Sankey diagram drawing software, but rather a modeling or calcalation tool for carbon footprints. Still, I think, this is a fine use case where Sankey diagrams unfold their full visualization power. It can be immediately grasped which stage of the life cycle, or which raw material or energy supply contributes most to the carbon footprint. Note: Have added this to the software list. The rounded Sankey arrows are definitely not very common, but are used nicely here. The arrow magnitudes represent weighted emissions potentially contributing to climate change, measured in pounds of CO2-equivalents. The values are for an average 0.75l bottle being shipped. When an arrow get’s wider at a certain point (e.g. Bordeaux to L.A.), this means a change in transport mode (e.g. from ship to truck). The comments to Dr. Vino’s post are well worth reading to understand the diagram better. I am not sure whether it has been taken into account where the wine, typically being shipped in tanks, is filled into glass bottles (adding to the weight, and consequenty to the transport related emissions). 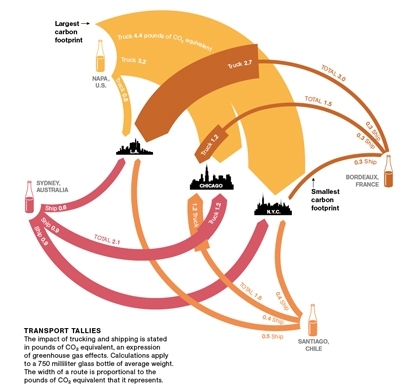 So from this Sankey diagram we can learn that Californian wine being consumed in New York has the highest (transport) carbon footprint, while the French rouge being savoured in the same city comes with the smallest footprint. BTW, I heave heard that there are studies that look into the life cycle assessment and carbon footprint associated with wine production, e.g this one. Would be interesting to find a carbon footprint Sankey Diagram that combines both wine production, transport, and end-of-life climate change impacts, in order to compare the different phases and their carbon footprint. The paper titled “Carbon Accounting and Carbon Footprint – more than just diced results?” by Prof. Mario Schmidt from Pforzheim University describes the various approaches of corporate carbon accounting, carbon footprint of products, and Life Cycle Assessment LCA. Schmidt introduces a method that allows determining “cumulative emissions … at each point of the supply chain up to the POS”, and calls this the CO2 backpack. The four Sankey diagrams above from the article illustrate the idea. They show (1) the CO2 equivalent emisisons along the supply chain, (2) the value added in a supply chain, (3) the relative CO2 emissions per value of product, and (4) the total emissions of the products along the supply chain with sectoral gate-to-gate, cradle-to-gate or crade-to-grave approaches. Schmidt is an acclaimed expert in Sankey diagrams and has also published on the history and methodology of Sankey diagrams.